When learning how to set climbing routes on artificial walls, setters are often told to set route difficulties according to a "bell curve". An example of this is mentioned on this page. What is the origin of this "bell curve"? Is there any science behind it, or is it just a dogma? Has anyone compiled statistics about the distribution of climbers' grades? If so, can I find these statistics somewhere? Most climbers don't onsight 5.13 and V12. While you should try to set routes for these climbers, you should remember that the bulk of your clientele (=profit) comes from climbers in the 5.10-5.11 range. This obviously varies from gym to gym and is something that management / the head routesetter should have more detailed statistics for. While you might be 6'5" with a massive wingspan, or 5'0" with small fingers, you shouldn't set with a requirement for a specific body type. While the occasional reachy/dyno problem or scrunched crimp ladder isn't bad to set per se, the danger is having too many problems set in a way that becomes "you must be this tall to get on the boulder." Always try to set in a way that accommodates different body types. For example, alternatives for feet or forcing body positions, rather than a problem simply requiring the climber to be tall and make a large span. I'm reminded of a drill that Steven Jeffrey (a relatively famous route-setter) would take new setters through. This can also be a good mental exercise to run through when setting. He would have them initially set a ~V8 route and critique it. Then, having committed to that particular movement and set of bolt holes, they would have to turn their problem into a V3 by only changing out holds and not the location of the holds. If this proved impossible, then it means that the original v8 contained a shut-down move that was height dependent and therefore was a bad problem for the gym. In some sense, indoor gyms should take their cues from outdoor climbing. While the insane mega-projects stand out more sharply in our memory, the typical route at the typical climbing destination isn't truly that hard. Mountain Project offers a breakdown by grade (not even total number of ticks at each grade) for each climbing area in its database. Keep in mind that all of these distributions were simply the number of routes by grade in the database, not the total number of ascents per grade. If we looked at a plot of number of ticks vs grade, we would expect all of these distributions to shift dramatically to the left. The bell curve in the post you have referenced is simply just a visual representation of some statistics; Namely, the number of climbers the gym serves, that are able to climb at any specific climbing grade. It may look slightly different at each gym, but if you were to add up these numbers yourself and plot them, you could create a similar representative curve and would find some similarities. From a sports science perspective, the largest gains come early on in a sport, so most people don't stay in the absolute beginner zones very long. Since most people aren't elite climbers, you can guess that the intermediate area will have the highest numbers. Here is an example of a simple bar graph, with the blue line representing the bell curve. Hope it helps! 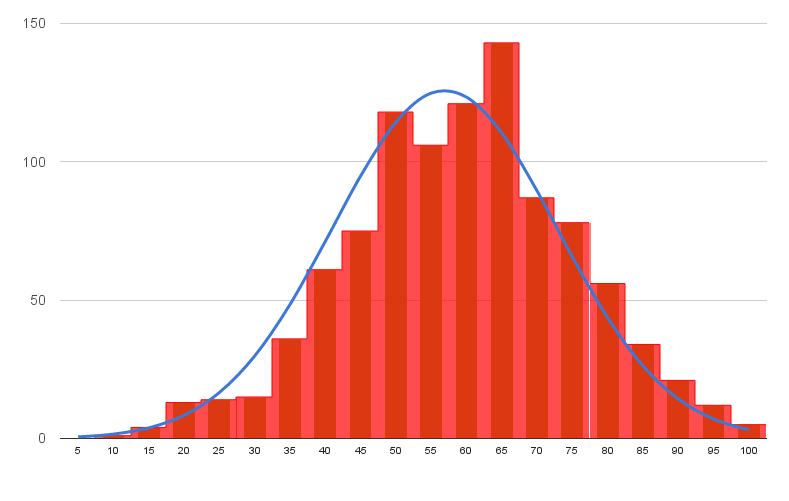 A bell curve simply measures your median level of climbing ability in your gym. The "science" behind it is simply to cater to your customers, you need to set routes to attract the biggest demographic to your gym, which for most gyms is in the easy to intermediate range. At my local wall, one of the ways we would determine the "median" of our climbing demographic was during our Everest Challenge event. Hundreds of people would climb day and night to climb the elevation of Everest on the wall, and track which ropes they were climbing, and how many times they climbed them. At the end of the event it was easy for us to look at the data to see which ropes were climbed the most, and determine which grade most people were climbing. The route setters would then know which grade of routes they needed to set more of. I set routes for years at my university gym and for competitions. I can tell you it's easy to set easy routes, and easy to set really hard routes, but to set intermediate routes inside that curve at the level where the majority of your climbers abilities are - is quite difficult. Easy route = Bunch of big jugs close together in a ladder up the wall, there you go kids. Hard route = A few garbage holds that are hard/hurt to grab and move off of; or, a series of really strenuous moves that the average person can't piece together without lots of core strength, training, and a lot of screaming. Intermediate route (your bell curve routes) = trying to balance between easy and hard, without giving the stronger climbers the ability to dyno through half your route, bypassing many of the holds and ultimately reducing the difficulty rating of the route. The ultimate challenge in setting intermediate routes lies in forcing beta. It's almost like a chess game, where you're trying to plan ahead in order to force your opponent to make the moves you want them to make. Forcing moves in a climbing route at an intermediate level is the hardest part of route setting, and takes a lot of experience, skill, and imagination. I would spend hours working on a single move in some routes, making it almost impossible to pass that section without using the exact beta I had intended them to use. The move wouldn't be that complicated, but if you didn't use it your balance would get thrown off to the point you could keep a grip on your other holds. Ultimately though, someone always manages to find a different beta to bypass a section, even if the move is more strenuous than the prescribed beta, and causes them injury in the process. One thing I would do to force people to think about their footwork is use garbage holds like two-finger pocket holds in places where stronger climbers would normally cut their feet and campus through cruxes. I figured the threat of blowing a tendon would be incentive for them to change their climbing style, and actually spend some time figuring out the beta I had intended for them to use. Alas, instead of using their heads to solve the problem using a series of less strenuous moves, they would shove their fingers in the pockets, pull hard and shred flesh trying to dyno past half the holds. The "curve" for each gym is going to vary place to place, and will be determined by the demographic of climbers that frequent the gym. Each gym may employ its own method for determining how many of each grades need to be set, some will simply be at the mercy of whomever sets the routes and the style of climbing they favour. Not the answer you're looking for? Browse other questions tagged rock-climbing bouldering route-setting or ask your own question. How can I improve my footwork while rock-climbing? How to progress in rock climbing after grades v4 / 5.11+? How to make rock climbing more challenging without changing to a more difficult route?